Former congressional press secretary Rochelle Ritchie said platforms need to take complaints more seriously and users should report abusive behavior. NEW YORK: A former press secretary for the Democratic Policy and Communications Committee threatened on Twitter by pipe bomber Cesar Sayoc wants social media sites to take complaints about abusive behavior more seriously. After Rochelle Ritchie, a guest political commentator for multiple media outlets, tweeted a picture of herself sitting in the green room at Fox News, she received a chilling reply from Twitter user Cesar Altieri, Twitter handle @hardrock2016, an alias of Sayoc. The message insinuated her body would be found at the bottom of the Everglades swamp and told her to hug her loved ones "real close" every time she left home. "I was like, ‘Who is this guy to threaten my life like this?’ So I reported it to Twitter immediately," she said. "I felt like ‘I am going to report him and they are going to take his page down or suspend him and that will teach him a lesson.’"
However, within seven minutes of reporting it, Ritchie received a message from Twitter stating "there was no violation of the Twitter rules against abusive behavior." Ritchie said she quickly "let it go" and went on with her life. "He was just another idiot," she added. However, hours after Sayoc was arrested for allegedly sending packages filled with explosive devices to CNN’s New York offices and high-profile figures critical of President Donald Trump, Ritchie started getting comments on the post with @hardrock2016’s threat. They informed her that her abuser was Sayoc. "I was stunned," said Ritchie. "I was angry and fearful because I live in Manhattan, so CNN and those places pipe bombs were sent aren’t far from me. I left work and called my parents to let them know what was going on. From there, I started doing TV interviews." Ritchie believes some negative comments she said on Fox News about Kanye West visiting the Oval Office might have angered Sayoc. On the day of Sayoc's arrest last Friday, Ritchie tweeted angrily to Twitter about the fact the site didn't take his threats seriously earlier in October. Her tweet has since garnered 203,000 likes, 92,000 retweets, and 4,000 responses. "I did not expect that tweet to get as much attention as it did," she said. "I understood it was a pretty big deal. But when you hear he had attacked Andrew Gillum [Florida Democratic candidate for governor] on Twitter, you think: Why aren’t other people on it?" Twitter told CNN on Tuesday it only received two user reports about Sayoc's account before he was identified as the suspect. Ritchie was one of them. "The fact only two people reported this guy and he had so many vicious threats to multiple people, including high-profile politicians, is unacceptable," said Ritchie. Over the past week, Ritchie has been interviewed by Fox News, CNN, NPR, Ebony magazine, The Root, and USA Today. However, she doesn’t totally blame Twitter for dismissing her complaint. She noted that if more people had reported Sayoc the site likely would have looked deeper into the matter. "Report these people every time, even it’s not directed at you," said Ritchie. "It’s time for this country to identify white nationalists and white supremacy organizations as terrorists. It’s not enough to just charge people with hate crime. Before the hate speech becomes a hate crime, we need to ensure these people are locked up." Knowing what to do with threats like this is a challenge for social media. Freedom of speech isn’t always free, said Ritchie. "If you are dipping into hate speech or hateful behavior, the consequences could be your page is shut down," said Ritchie. "That’s the bottom line. Hate crimes are crimes for a reason. Most of the time, we can see it coming because of the hate speech behind it." Ritchie said Twitter has not directly apologized to her about the mishandling of her complaint. However, the social network’s @TwitterSafety page tweeted last Friday it was "deeply sorry for that error." 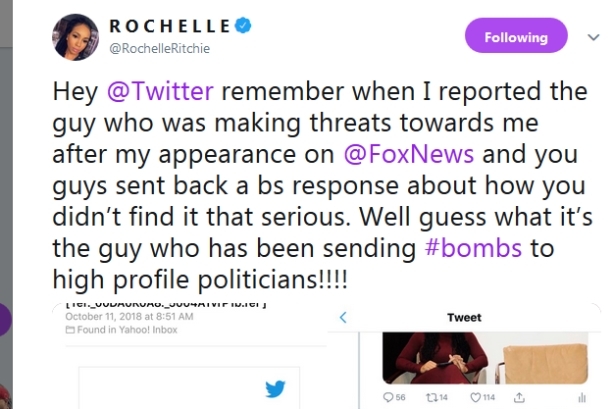 Ritchie said that, because Twitter did not include her handle @RochelleRitchie in the tweet, she didn’t know about it until CNN anchor Don Lemon brought it up in an interview. "I never got a direct apology," she said. "No one [at Twitter] called me." A Twitter representative told PRWeek in an emailed statement that Sayoc’s account was permanently suspended and the social network is actively engaged with law enforcement to support its investigation. "Let’s be clear: violent threats, targeted abuse, and hateful conduct are against our rules," the rep said. "This type of content does not enable or empower speech and has no place on our service." Twitter is moving forward in two ways, the rep said: By improving its appeals process to address errors in enforcement decisions and using new technology to detect abusive content without requiring someone to report it first. "We know we have to take more of the burden off the shoulders of victims of harassment and threats," the rep said. "We must do better and we will do better." Twitter removes 93% of illegal terrorist content proactively, 74% using its own technology, a source familiar with the matter said. It recently tightened its policies in response to violent extremist groups, hateful conduct, and dehumanization. If Ritchie gets any more threats on social, she will continue to report them to Facebook and Twitter, but will also take an extra step of telling the police. "I don’t report things like racial slurs or derogatory names," she said. "But if you threaten my life, I will take it to the police."